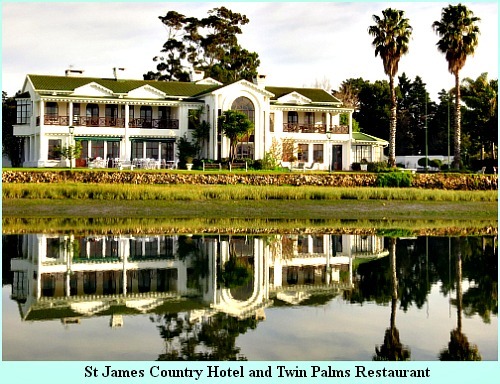 Twin Palms Restaurant at St James Country House Hotel on the Knysna Lagoon was Sedgefield’s Slow Food October venue for the USA-Deep South Workshop. 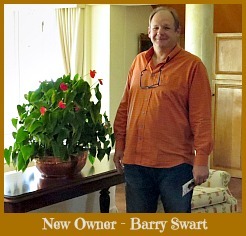 Colin Capon introduced Barry Swart the owner to be who is taking over from Derek and Trish Goldby who are retiring after 16 years in the business to enjoy other things. Barry has plans to introduce a terrace menu, that will capitalise on St James' spectacular setting. The casual dining menu will include favourites such as ploughman’s platters, and fish and chips. Soon traditional High Tea will be added and could fast become a favourite for summer afternoon get-togethers overlooking the picturesque Knysna estuary. 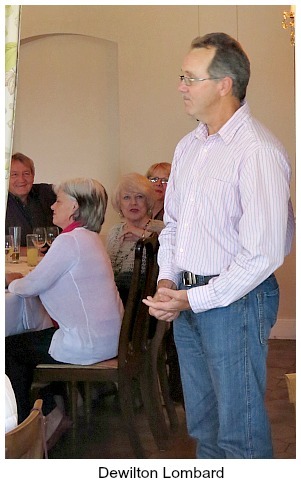 He also intends to give new life to the traditional Sunday fine dining lunch menu at Twin Palms. Dewilton Lombard, an ex Zimbabwean farmer was our first speaker of the day at Twin Palms. His last 10 years read like a fast paced action adventure story. His profitable farming operation in Zimbabwe consisting of growing tobacco, maize, groundnuts, paprika, beans and flowers (roses for Holland) and included a lucrative grading and stripping shed for tobacco growers throughout the country – was lost through the notorious land invasion process in 2003. Hopeful in starting a new life far from African woes, he and his wife and 3 children flew to Brazil to set up a commercial grading factory that employed 360 locals. However, within a short 6 months through deception and collusion among the “local powers” aided and abetted by language difficulties he lost his life savings and was forced to beat a retreat back to Zimbabwe with his family. He then set about farming roses for export –36 different varieties on his father-in-law’s farm. After 2 months, the farm workers went on strike. It ended when Dewilton called in the CIO (dreaded Central Intelligence Organisation) who asked the workers who their leaders were. The CIO proceeded to beat the ringleaders to a pulp before taking them away. They were never seen again. The workers, needless to say, went back to work. After some time there was a falling out between father and son-in-law and entrepreneurial Dewilton decided to go into the business of importing much needed fuel. This led to him “getting into bed” with General Solomon Mujuru (also known as Rex Njongo) who arranged an import licence for him in half an hour. By 2007 a month’s groceries were costing ZIM$15million but the situation arose when there were no groceries in the shops. The family moved to South Africa where they eeked out a meagre existence. 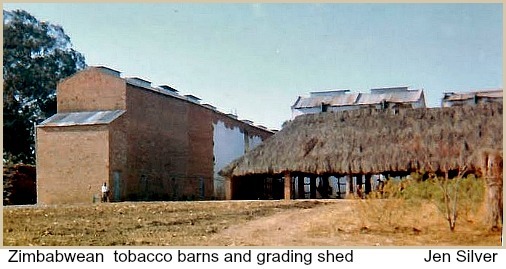 In 2010 Dewilton decided to move back to Zimbabwe and set up a tobacco grading shed again. This was much needed and was immediately supported by most of the big companies. After some strong resistence Dewilton persuaded his wife and children to return to Zimbabwe in 2011. However BEE regulations insisted that businesses be 51% owned by black partners and when Zanu PF arbitrarily got involved in the business, the writing was on the wall, so the family took what possessions they could and literally “ran for their lives”. Now living in Knysna Dewilton got in touch with the Knynsa Municipality looking for some undeveloped municipal land and was directed to Ilsa Van Schalkwyk who fortuitously found 30 hectares of land at Karatara. This gave Dewilton the opportunity to put together a business plan for a local community hydroponic herb and vegetable growing project at Karatara that he intends to mentor. Waste water channeled from the purifying plant to existing old maturation ponds, the first will be a reed bed, will be pumped on to the other 5 in order to breed Tilapia (bream) for local consumption. The nutrient filled fish water will then be passed on to fertilise the herbs and vegetables hydroponically. Local engineer and member of the Slow Food Convivium, Terry Cockroft is assisting with managing the water requirements for the project. It is envisaged that 40% of the produce will be used locally and 60% will be exported to provide funds to support the community in other ways. It is important Dewilton says to put in the ground what people want to buy. The aim is to take the middle-man out and sell direct to the consumer. Potential partners in the scheme are Israeli, Austrian, and Swiss businessmen because it is cheaper to get foreign sponsorship than borrow money from local banks. Europe seeks after ‘Green” and tax reductions are offered for such projects -a win-win situation all round. The folk at Twin Palms were riveted by Dewilton's story–we all wish him well with this innovative scheme that could go a long way in reviving the socio-economic environment of the Karatara community. The next speaker at Twin Palms was Lindy, a web and graphic designer who's also experienced difficult times. After a messy divorce that left her with a small 11 hectare farm and nothing else she searched the world-wide web for some ideas for her farm and researched the concept of cage-free chickens. She came across Joel Salatin a 2nd generation holistic American farmer of Polyface farms who uses innovative integrated sustainable farming techniques. He’s an author of several books and a lecturer, who’s also a subject in a number of alternative type documentaries. She noted his mention of portable coups for his chickens. Some time later she met Filip through the internet who was able to design cost effective movable chicken houses adapted for her environment and started her project with 100 chickens. When it was time to slaughter them she went and bought a deep freeze from Kloppers. When it wasn’t big enough, she asked her neighbours if they wanted chickens. The outcome was it kicked off the business …most effectively through word of mouth and its continued that way since. Presently producing 500 chickens a week, Lindy doesn’t sell to big supermarket outlets but she’s at the Outeniqua Market every Saturday and delivers along the Garden Route personally, every week. Next Lindy researched free-range eggs and found Zimbabwean–born Mike Bosch of international repute at Bela Bela in the Limpopo Province. He had developed an indigenous breed of chickens known as Boschveld chickens to assist with de-ticking his cattle at their watering points. He found he was able to reduce expensive dipping from 26 to 14 times a year. Besides reducing the presence of chemicals in the environment this action had the unexpected knock-on effect of ox-peckers returning to his farm. Lindy has purchased some of these resilient chickens as layers. The handsome Boschveld breed is a combination of hardy Ovambo, large Matabele and prolific egg-laying Venda strains that have beautifully diverse colours reminiscent of indigenous Inguni cattle. 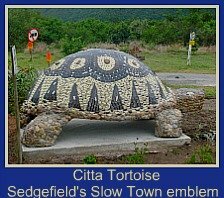 Ideal for the African environment, they clean up pests in the fields and flies around dairies and produce beautiful golden sunset yolks in their eggs. Lindy now has a viable farming operation and supplies a wide range of products related to her chickens to Garden Route customers on a regular basis. 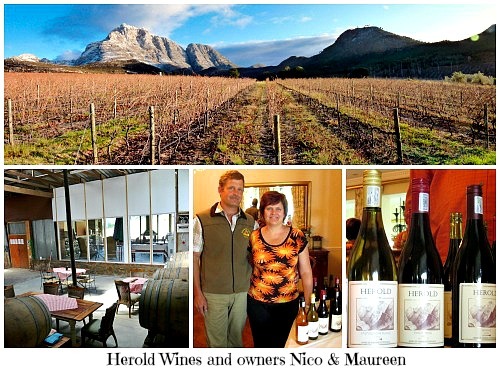 Nico and Maureen from their beautiful farm at the top of Montagu Pass then presented Herold Wines for tasting at Twin Palms. Among the mountains at high altitude Nico said the grapes have a long cool growing season. They use no pesticides or irrigation but spray for fungal diseases. Their Sauvignon Blanc is more tropical with less grassy, greenpepper flavours because of an open canopy and exposure to lots of sunlight. On white grapes a reductive technique is used that also keeps the wine away from oxygen that results in less flavour and darker color. The cool sea air over the vines results in low sugars and low alcohol content. Red grapes are processed in the regular way and after fermentation in open containers the wine is put into oak barrels, wood from oaks planted in Napoleon Bonaparte's life-time. Nico mentioned that the Australians have developed a polymer that breathes the same as wood and then they add wood chips to mimic the oak barrel flavour. He said there is little difference between cork and a screw–top but that the screw-top was cheaper. 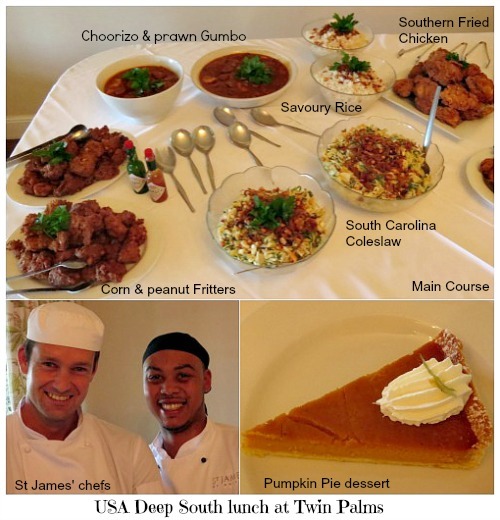 Twin Palms chefs had lunch ready to be served. Colin had made Southern Fried Chicken pieces with peanut and corn fritters and South Carolina Coleslaw. Chorizo and prawn Gumbo with rice was the signature dish of the Twin Palms Restaurant. Dessert was Pumpkin Pie. 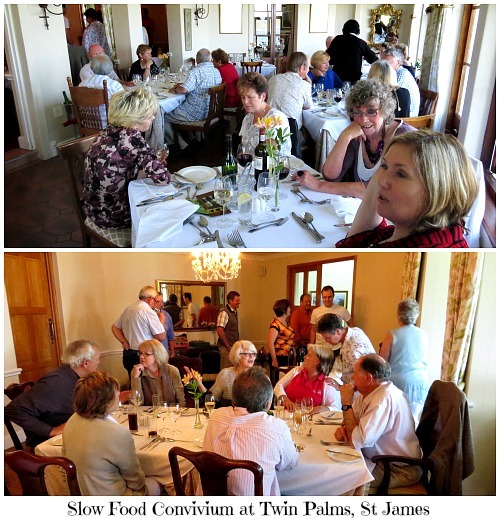 Another fine day’s dining at St James’ Twin Palms Restaurant was enjoyed by everyone. Thank you to Barry for providing the venue and the chefs for the great food and the speakers for their interesting and informative presentations. 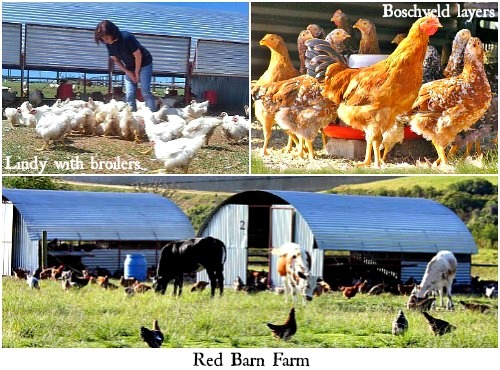 At Red Barn Farm outside George our small family tries to produce the very best free-range pastured poultry for the true farm fresh quality connoisseur. Our free range eggs contain half the cholesterol, are twice as rich in Vitamin E, up to six times richer in beta carotene and a whopping four times higher in essential omega-3 fatty acids! Taste the difference for yourself! Polyface Inc. a family owned, multi-generational, pasture-based, beyond organic, local-market farm and informational outreach in Virginia's Shenandoah Valley. We are in the redemption business: healing land, healing the food, healing the economy, and healing the culture with ethics-based contrarian business ideas.